Submitted by Keith Smith on 11 June 2018. 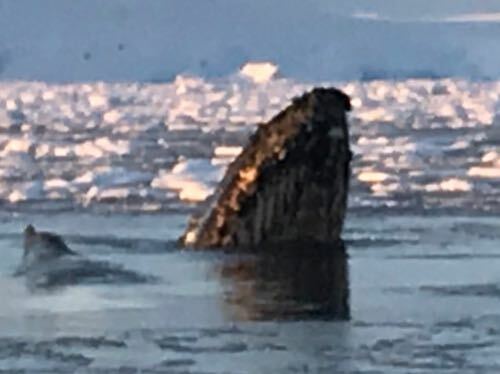 KC Bierlich, a Doctoral student at Duke University, and Post Doc Michelle Shero, who works with KC at Duke’s marine lab in Beaufort North Carolina, are in Antarctica to study whales. KC’s dissertation is researching how humpback whales, whose migration usually takes them over a thousand miles. 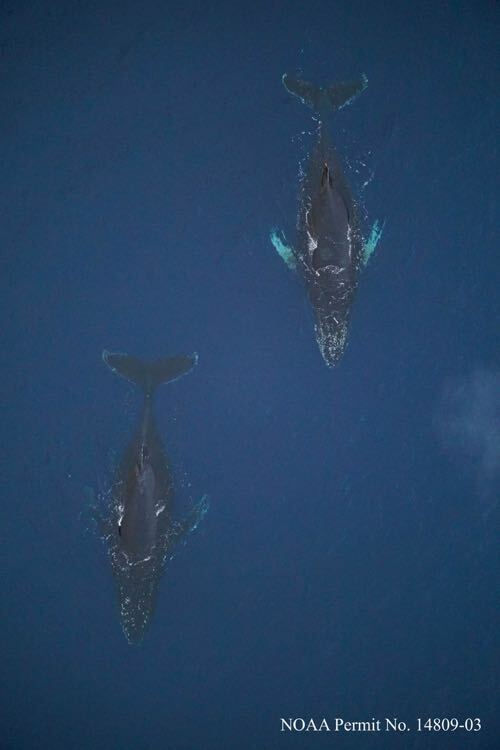 From somewhere near the equator to the chilly waters of Antarctica, this yearly migration that these whales go through has a substantial effect on body weight. During the mating and birth periods near the equator, these giants of the sea rarely eat any food. They travel to Antarctic waters to feed on the abundance of krill in the ocean down here. Humpback whales are what we refer to as baleen whales, which mean they take in huge mouthfuls of ocean water and filter the krill out. 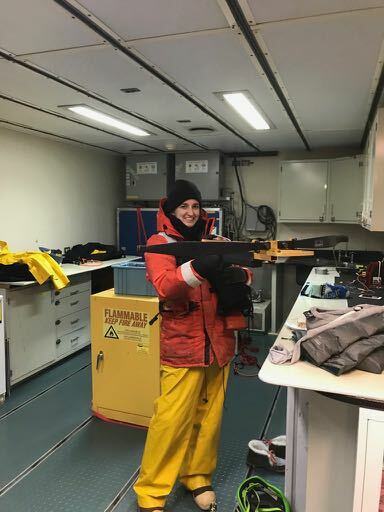 KC’s research focuses on what their body size is when they arrive in Antarctic water, and then what is it like right before they leave Antarctic waters. But how does one measure the size of a huge organism such as the humpback whale? KC is using a drone for this. 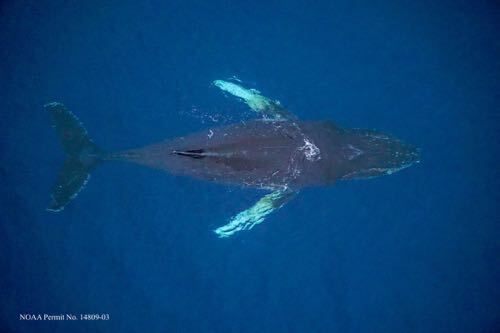 Overhead shot of a humpback whale. You can see the difference in sizes of the two whales. An MT accompanies KC and Michelle from the Laurence M. Gould icebreaker in a Zodiac boat where they will look and listen for whales. A lot of times you can hear them exhale before you actually see them. 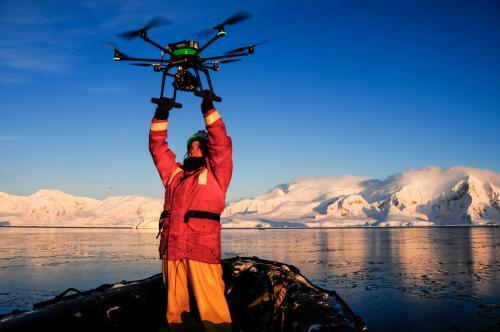 Once they spot a whale they stay a little ways back and launch the drone that KC flies over them to take pictures of their size. With these images KC can determine how a whale has changed during its season in Antarctic waters. Since KC was going to be down here, the principle investigator overseeing KC’s dissertation asked him to also capture some tissue from the whale. To do this KC and Michelle have crossbows that are fitted with a special tip that when it hits a whale takes a quick biopsy and falls out of the whale. Michelle demonstrates how to use the crossbow to obtain the biopsy. These tiny biopsies supply a vast array of data. A sample of tissue taken with a biopsy dart. Tests that will be done back in the states will include DNA testing, gender, and hormonal information that allows for a researcher to know if that individual is pregnant. 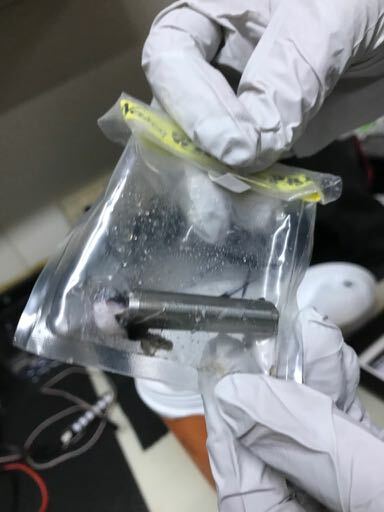 Stable isotope detection is important so the researchers can tell what the animal has been eating, and they also look at micro biomes of the skin to detect any health issues. KC sailed on the LMG in February, which coincides with the arrival of the whales after not eating for months on end. He hopes that this trip will give him the data needed to continue work on his PhD Dissertation. Hi! I am in Mr.Penn's class. How long can whales hold their breath?